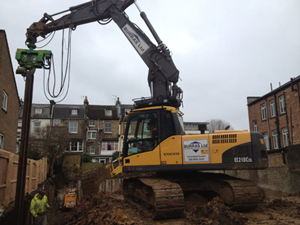 Bored pile walls provide an effective solution for insitu earth retaining structures and can be designed to suit specific ground conditions and performance requirements. Retaining walls can be constructed in a variety of soils using either standard auger piling techniques or the continuous flight auger (CFA) method. 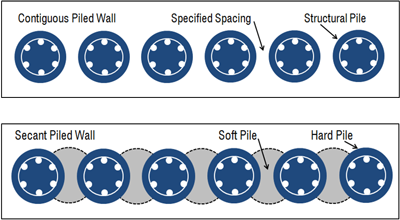 Piles are either interlocked (secant wall) or installed leaving a nominal 200 to 300mm gap between the piles (contiguous wall). The CFA system has been successfully developed for the installation of contiguous and secant retaining and foundation wall structures for both temporary and permanent design solutions. BURRAS Ltd offers a design and construct service for all augured pile requirements. Steel sheet piled wall construction is an established and proven retaining wall solution both for permanent and temporary works situations. 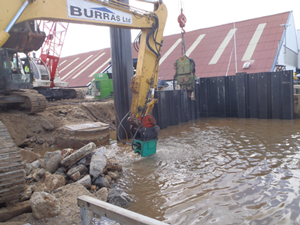 BURRAS Ltd has extensive experience in the handling and installation of sheet pile systems utilising a variety of pile driving and handling techniques matched to the site conditions and design requirements. Whatever your sheet piling needs BURRAS Ltd has the capability and experience, and will be pleased to provide a quotation against a pre-determined design or alternatively provide a full design and construct service.